At Milan Dragway our main goal is to provide you with a safe and enjoyable day at our track. 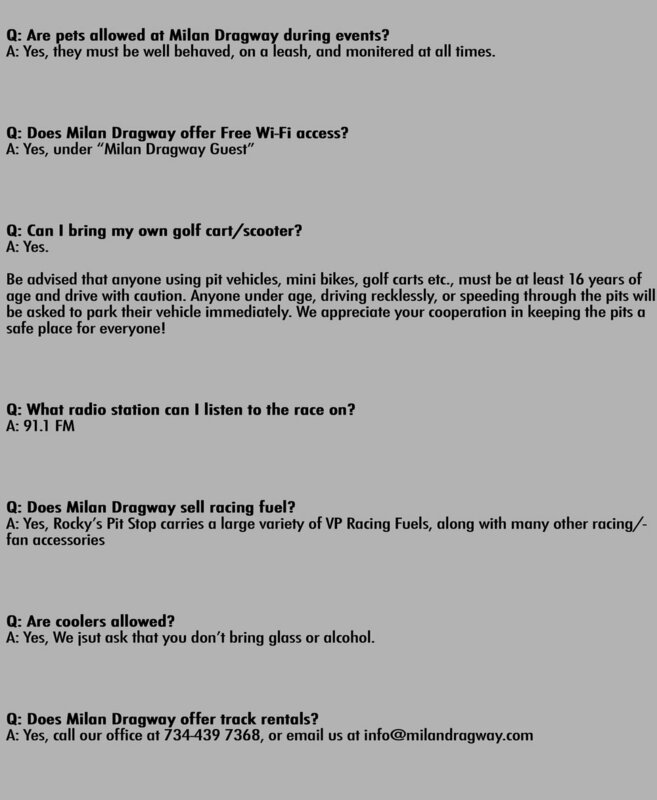 Please take a minute to read over our drag strip gate policies so you can prepare in advance for what is permitted and prohibited. If you have any additional questions please check out our FAQ section or contact us at 734-439-7368. Thank you for helping us to provide everyone with an enjoyable experience at our track! Below is a list of things to help you out on what to bring and what to make your visit to more enjoyable. Comfortable shoes - Many events involve walking so you will want to wear comfortable shoes! Food - You are able to bring in food and snacks with you into the events, but our concessions have a pretty big menu so don't worry if you don't want to pack a lunch! Cash - While there are ATM's for many events, it is a good idea to have cash for purchases at smaller booths (like the beer stand) where we can't take a credit card. Cell phone - There are no pay phones at the facility so be sure to bring your cell phone. If you had an emergency, you could always come to our office and borrow one of our phones!